Two long-lost life-size bronze horse sculptures that once stood outside Adolf Hitler’s grand Chancellery building in Berlin have been recovered in police raids in Germany. The equine artworks were among millions of dollars worth of art recovered when police staged 10 raids across five states in an operation said to be targeting the illegal art trade. Reports suggest the operation focused on eight people suspected in dealing in such artworks. 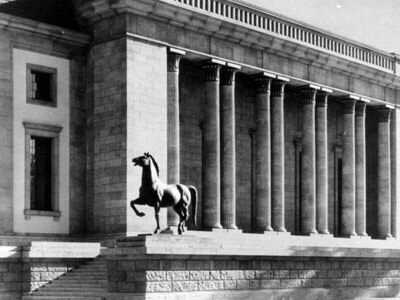 The statues, known as the “Walking Horses”, were custom-made made by Josef Thorak for the German building. They were among thousands of bronze and marble artworks commissioned by Hitler to adorn Berlin during his rule. The horses took pride of place on either side of the garden portal stairs into the Chancellery in downtown Berlin. He could see them from his office. The horses were removed as World War 2 turned against Germany and the capital came under increasing Allied air attack. They were taken to a town east of the capital which was later overrun by Soviet forces as they pushed toward Berlin in the dying throes of the conflict. The horses were next seen in 1950, adorning the sports grounds of Soviet barracks in the nearby town of Eberswalde in what was then communist East Germany. They were said to have been painted gold and were suffering from bullet damage. The tails had been broken and reattached in poor fashion. It is believed the horses may have been sold by East German authorities around 1989 as the communist government was faltering before the Berlin Wall was torn down. The horses have not been seen since, until they were found in Wednesday’s raid on a warehouse in Bad Duerkheim, in Rhineland-Palatinate. Raids were also carried out on homes in Berlin, Bavaria, North Rhine-Westphalia and Schleswig-Holstein. It is likely that the horses will become the property of the German Government. The Chancellery itself was destroyed by Soviet forces when they occupied Berlin. Eight Germans, aged 64 to 79, are under investigation in the police art probe. It is understood the inquiry was launched after police learned that someone was trying to sell the artworks on the black market. The Bild said police had learnt that €4.4 million was being sought for the works. The sculptor Thorak was born in Salzburg, Austria, 1889. His reputation was firmly established in 1922 when he created Der sterbende Krieger (“The Dying Warrior”). The work, in Stolpmünde, memorialised the dead of World War I. In 1933, he and Arno Breker operated as “official sculptors” for the Third Reich, with Thorak using a studio outside Munich.